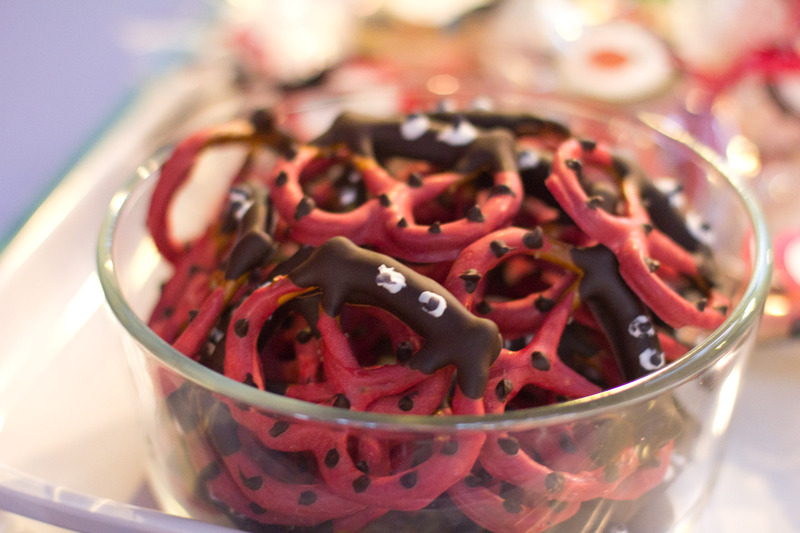 For baby’s party last week, I made ladybug pretzels. For the most part, I was happy with the way they turned out. I got the idea from a few posts I saw online but all of the folks who did them seemed to be the type who find this sort of thing easy. I ain’t one of those people. I wish I was though. Wop wop wop. In case there are others out there who are like me, I thought I’d do a tutorial post on how to make these ladybug pretzels or “Ladybug Pretzels for Dummies.” 🙂 I’m going to try to include what the others don’t tell you! I bought a 1 pound bag of pretzels, thinking it would be plenty. Believe it or not, it only yielded about 35 ladybugs. Why? Well first, so many in the bag are broken. Next, so many of them are deformed. And I even looked for a bag that didn’t seem so broken up. I also bought a good brand, thinking that would minimize the number of misshapen pretzels. Not so. Third, I um…broke a whole bunch of them. 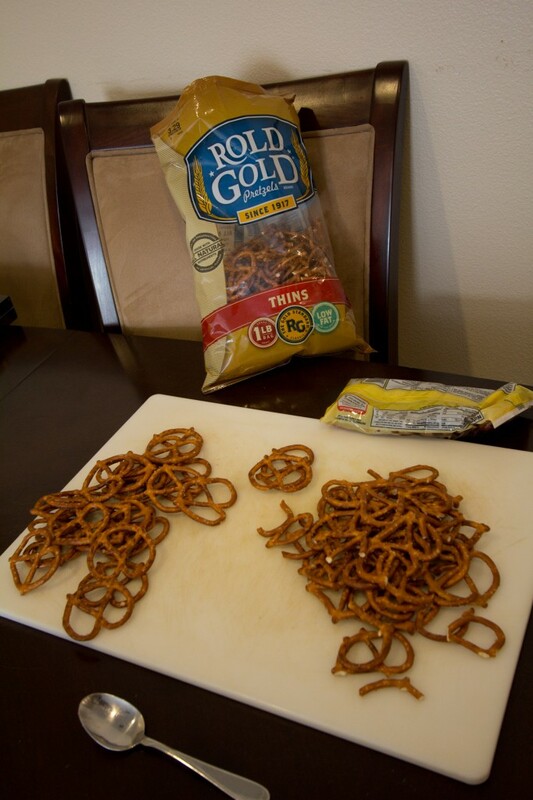 Step 1: sort through the pretzels and pull out all the ones you can use. I actually made three piles – one for broken piece rejects, one that had definite first stringers and one pile of maybes (you can call these sloppy seconds if you’d like). Step 2: Line your baking sheet (or sheets, depending on how many you plan on doing) with parchment paper. I made the mistake of thinking it would be fine without the parchment paper. I was wrong. Once I had done the first dip and they dried, every single one of the buggers broke when I tried to pick it up off the cookie sheet. The chocolate stuck to the sheet and the pretzels are too delicate to make it through the break up. So sad. So I had to go back and do it again. If you don’t have parchment paper, I had success with a flexible cutting board. Since I could peel back the cutting board, the pretzels were spared. Step 3: Melt the red candy in a bowl per the instructions on the bag. For those that don’t know, the candy melts are basically white chocolate that’s dyed different colors. A quick note here (again, this is for dummies like me who could have benefited from someone telling me this)…make sure the bowl is big enough to fit a pretzel width-wise and also make sure you have melted enough candy melts to fill the bowl up to a height that will cover 2/3s of the pretzel if you stand it up on its edge. No one told me this. I dipped the pretzels by sweeping them back and forth to cover 2/3s and some of them looked sub-par. Don’t be chintzy with the dipping chocolate! 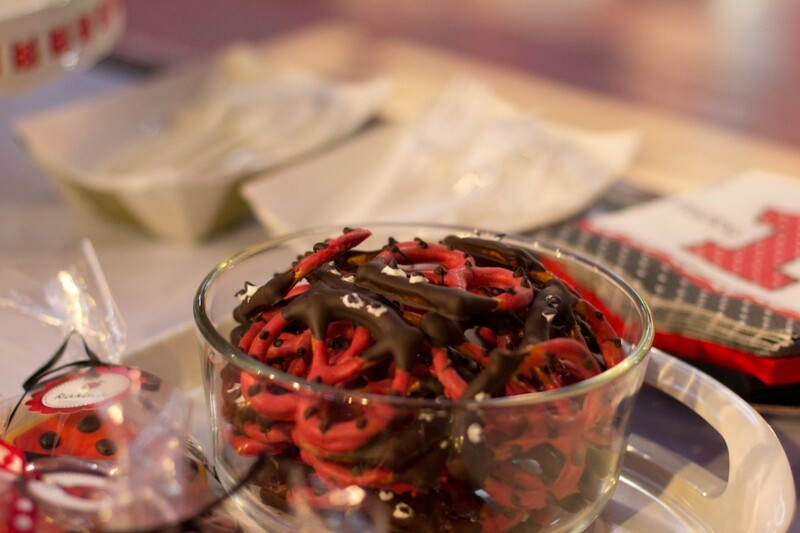 Step 4: Dip your first string pretzels in the red candy melts (hold the rounded bottom and dip the two winged top side first) and remove the excess chocolate. 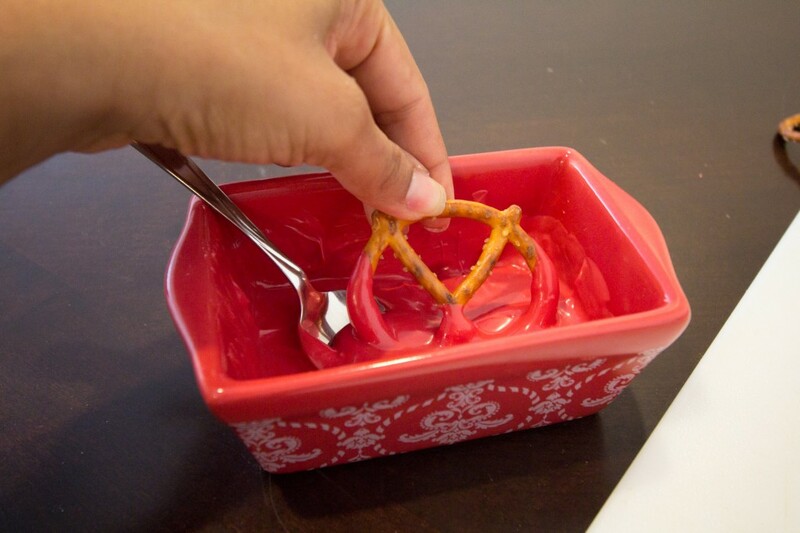 I did this by gently flicking the non-dipped part of the pretzel over the bowl. Oh ya, and don’t be a dope and use a red bowl. It makes it hard to see the melts. Seriously, this didn’t even occur to me. See how the middle wasn’t covered in red? That’s because the bowl should have been more full. Step 5: Let the pretzels sit until the coating is dried and hard. Step 6: Melt the chocolate chips per the instructions on the bag. Step 7: Dip the undipped side in the chocolate chips and lay on parchment paper to cool. Step 8: Create the ladybug dots by filling a piping bag fitted with a #2 or #3 decorating tip (I’m not going to get into how to do that – I had to figure it out, you can too!) with the brown chocolate. Pipe dots onto the red end of the ladybugs. If anyone has good tips on how to make dots, please leave a comment – I was shocked at how hard of a time I had making nice round dots. Step 9: Use the white frosting to create little eyes on the brown chocolate end of the pretzel. If you have it in a small tube, it’s super easy. I had some white and black frosting for some ladybug cookies I had made so I just used the back of a chopstick (Woah! So high-tech, I know!!!!) and dipped it into the white frosting and dabbed it onto the pretzel. They weren’t perfect but they got the job done. If you’re a perfectionist, you can always use a piping bag and tip. Step 10: Use the melted chocolate to put pupils onto the white eyeballs you created in Step 9. I just used a toothpick to do this. Admittedly, the eyeballs were a little creepy. But I think I liked them better with the eyeballs than without. They tasted great and I liked this little touch at my baby’s party. Ideally they would have been set out on a nice tray but the bowl we used worked out just fine. Your tutorial made me laugh. I too had to wing this project. I should have read this first! I ended up having to take a spoon and drizzle it into the corners because I couldn’t find a small, but large enough bowl to not have to melt 3 lbs of chocolate..lol. And, I didn’t have chopsticks, so I broke a plastic fork. First 2 tines for the eyes, then broke one more time off to do the dots. Oh, and the chocolate was melting as I tried to dip the rest of it because I was dumb and dipped the head first..lol. (mine are pink and green though) I just used white chocolate..
Omg I can’t wait to make these for my baby girls first birthday party in Oct. Thanks for you step by step directions. How far in advance can they be made and how did you store them? I made them the day before the party and once they had cooled in the refrigerator and the chocolate was nice and hard, I put them into a plastic container with a tight lid to transport them to the party. My guess is that you could make them at least 3 days in advance and still be ok. I’d just make sure you kept them in an air tight container. You have by far the funniest tutourial ever! I enjoyed it…you gave some very useful tips (even though you had to find out the hard way). 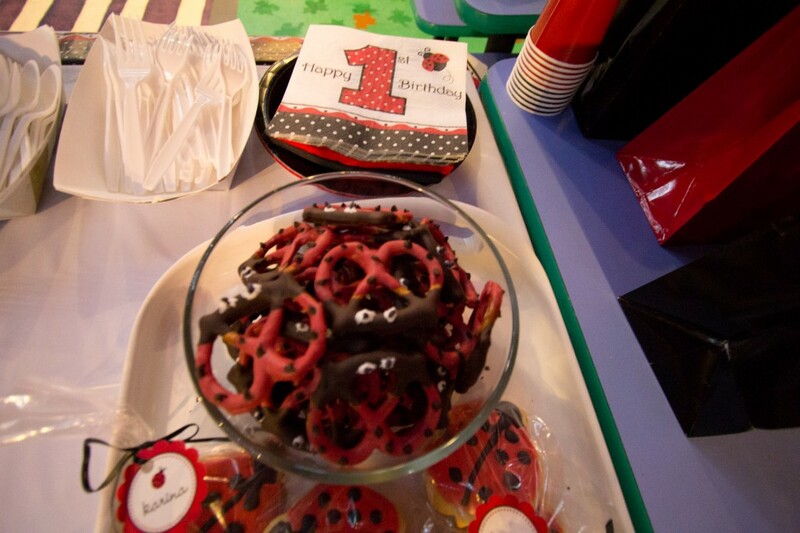 I will use all your advice and make these for my baby girl’s 1st Ladybug Birthday party. Thanxz! Thank for the tip I will have fun making this fir my job I think its great for kids and grown ups. I made these little cuties with the little pretzel twists and the big ones. It turned out really cute! Thank you for the idea. The end of a skewer is good. Also the end of a small paint brush is what I use. I have a few brushes that are just for baking. If you should forget and not use parchment paper next time, just put something hot (wet cloth hair dryer or heat gun), to heat the underside of the pan a bit. The chocolate will have melted slightly on the underside, which makes it easy to lift off with a thin spatula or lifter. Love the lady bugs. Must make some at the next baby shower I am at. Thanks! Wow. I really have some smart readers. I never would have thought of that – brilliant! Thanks for the tip! You can substitute with Wax paper – more economical and easier to work with!! Any one have any suggestions for a Halloween Treat similiar to this? I totally love these! my cousin would have too! im so making these and taking them to my grams and her daddy!!!!!!!! Can you not just buy these ladybug pretzels and save yourself the headache? I suppose you could (though I haven’t seen them or found them anywhere), but where’s the fun in that? Thanks for the great idea and thorough instructions. I ended up using a pastry brush rather than dipping since I felt it was too hard to get the excess off. The brush made it very easy to apply. This is wonderful! I checked Interest and no luck for directions! Thanks for the great suggestions! I plan to make them for my granddaughters 1st birthday next week. 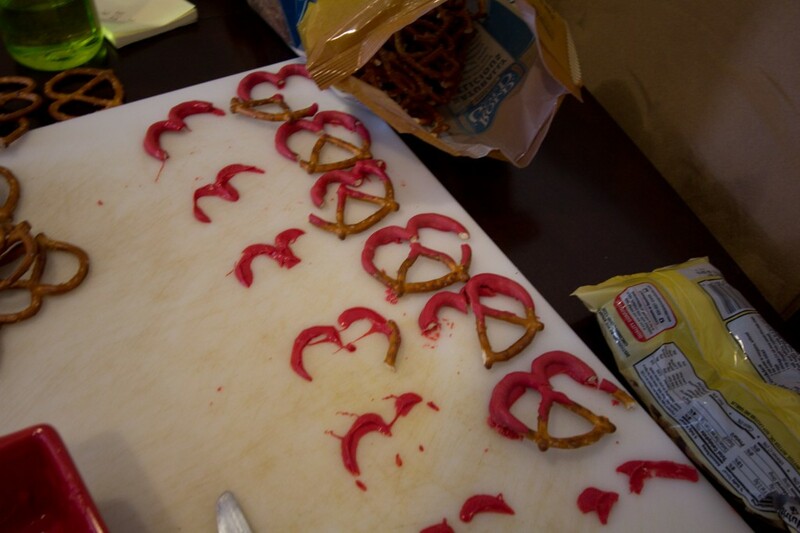 Let you know how my ten thumbs create the ladybug pretzels! I had to agree with one of the posts. your description of how you got where was funny and I could SO relate. also, I didn’t find the directions on Pinterest – just the photos. our reunion theme is ladybugs this year so we expect to see a lot of dots and I thought this would be a little something extra for all the ‘love bugs’ in my family. Thank you for sharing! AND for your great tips! Wish me luck! Good luck! Hope they come out great! Did the icing for the eyes harden or stay soft? I’m worried about the icing transferring. Thanks! 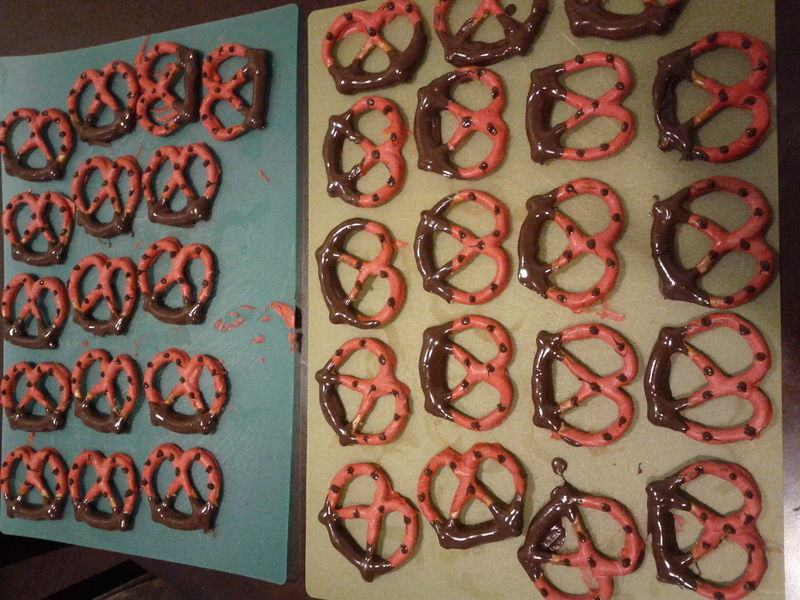 The icing did harden; they didn’t transfer or rub off onto other pretzels they touched. Good luck! These are darned cute! Who knew? I plan on making them for my pre-K grandson’s teacher’s birthday. She loves lady bugs and has her classroom decorated with them. Your post had great directions and were a delight to read.